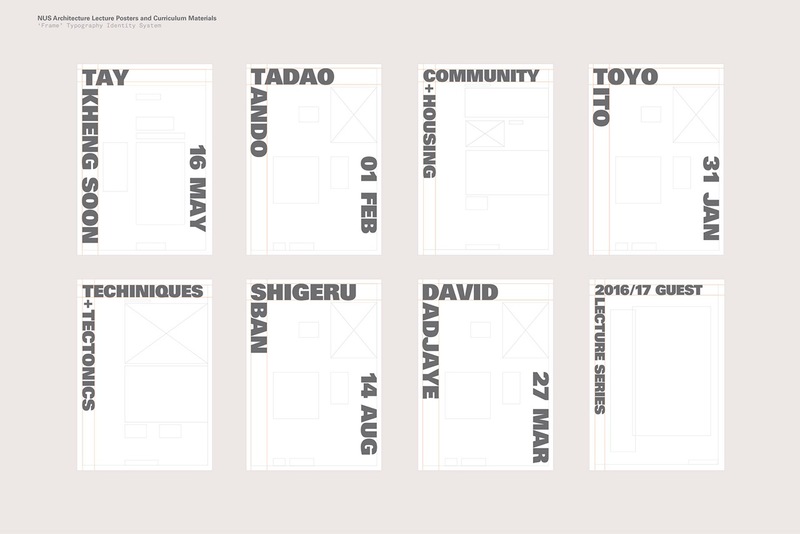 ADC Member Yanda from Do Not Design shares their latest graphic identity work for National University of Singapore: Department of Architecture. Do Not Design is commissioned to redefine a unified voice and look, tasked with designing a new graphic identity and reflect the research-intensive school’s creativity and modular organisation, enthusiasm as well as its mission of ‘nurturing creative global designers and critical thinkers for the built environment to shape Asia’s future and the world.’ Anchored by ‘framed’ typography, the new identity is derived in part from the structure of scaffolding on buildings, conveying the idea of education as a foundation. Univers—the neo-Grotesque typeface designed by Adrian Frutiger—plays a key role and is used to express confidence and clarity. The color palette was strategically chosen to stand out from the school colors of red and blue and from the buildings’ facades of yellow and grey, making room for rosy pinks, varying blues, tawny browns and ever greens. The system was designed to be easy to use by in-house staff and technicians (not trained in design) to work on. Beautiful and functional, this is the height of good design. First established in 1958, the Department of Architecture grew into a full program at the University of Singapore in 1969. But its growth didn’t touch all facets—namely, the course materials remained inconsistent, cluttered with information, and easy to ignore. Seeking to eradicate these design issues, Do Not Design strategically chose typefaces, colors and layouts that reflect a ‘less is more’ sensibility. 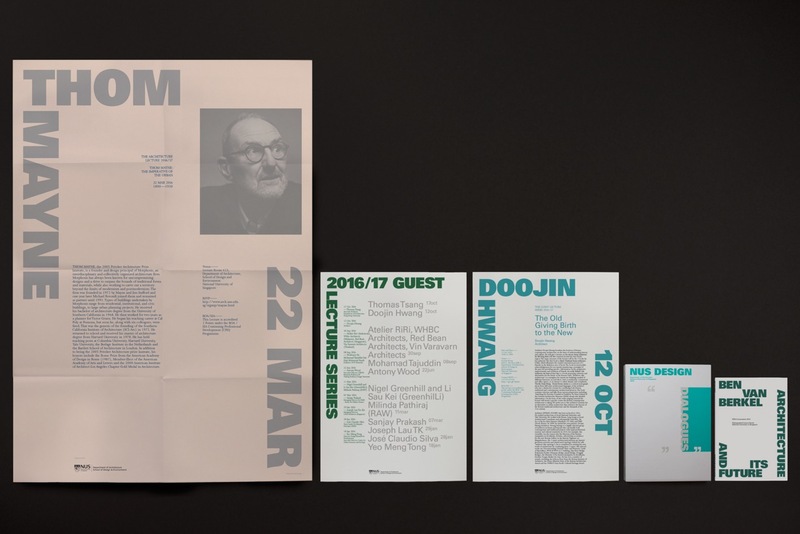 The new graphic identity stretches across the school’s communication tools from event and lecture posters, day-to-day materials, and more. We spoke to ADC Member Yanda, founder and creative director of Do Not Design, contributor to The Artist and His Model and managing editor of The Design Society Journal and exco of The Design Society—a non-profit organisation geared towards supporting the betterment of applied graphic design in Singapore—about the project. When you were approached to commission a new graphic identity for National University of Singapore, Department of Architecture, what were some initial ideas? One of the ideas was playing with scoring and folding to make the posters were angular like the facade of buildings. What was important for you to include and communicate in the design? We figured out that everyone takes posters for granted as there are too many around and they can be easily ignored. They were fighting for attention with so many other posters on the walls or notice boards, so we asked ourselves: how do we attract or seduce? More importantly, the whole system needed to be straightforward and not challenging for the in-house staff and technicians (non-design trained) to work on. How did you decide on a typeface? — we think it’s really interesting you have considered the architecture of the buildings— and the final layout for the new look? The system is anchored by a ‘framed’ typography—derived from the structure of scaffolding on buildings, and thus conveys the idea of education as a foundation. We derived the typeface, Univers, after rounds of selections which included New Rail Alphabet and Helvetica Neue. Univers is a neo-Grotesque typeface designed by Adrian Frutiger, chosen to express confidence and clarity in delivering communication. The color palette was strategically selected to attract the students and stand out from NUS logo’s corporate colors of red and blue, as well as the buildings’ facades of yellow and grey. You say the old identity was cluttered with information and inconsistent. Tell us how you solved the problem using design to arrive at a clean identity. 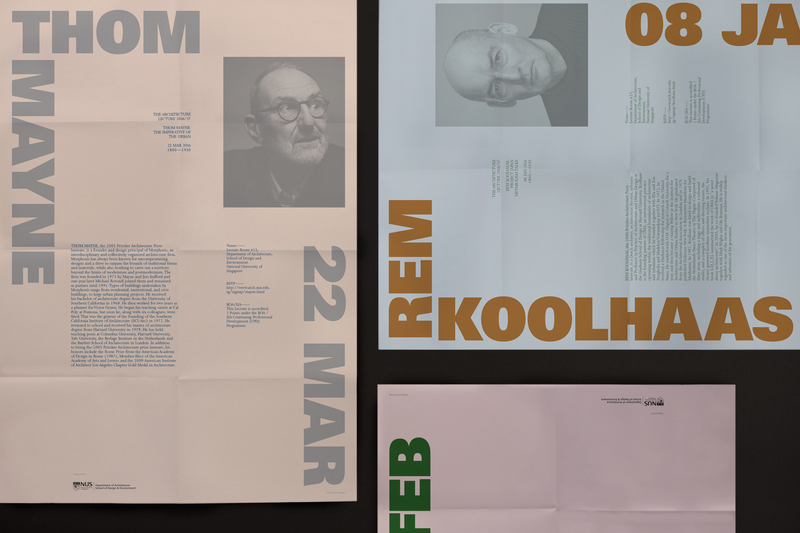 The previous Architectural Lecture Series posters were designed by TwoPoints from Hamburg, Germany and was implemented from 2014-2015. The other time a design house was engaged was probably back in 2008, by H55. They are both points of reference for us. What they’ve done is great, but the schools other curriculum materials like their Guest Lecture series and the Studio Thesis posters weren’t “designed”. 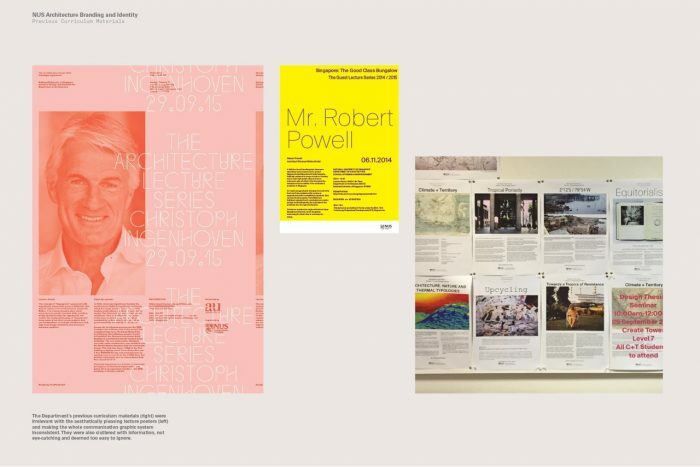 Nothing was coherent or aesthetically pleasing from the Architectural Lecture Series posters. We decided the curriculum materials and studio thesis posters had to look good too, because they’re the ones that will be seen the most, unlike the Lecture Series posters or the annual yearbook. That being said, we built a system whereby it primarily highlights one or two key points—name of the architect and the date of the event for the Lecture posters, and the titles for the curriculum posters or the publication. For the Lecture Series posters, the names and dates are probably the most important piece of information we needed to communicate, so we made it as big as possible. To be honest, it wasn’t easy to design a system and a template for non-designers and technicians to use—bearing in mind that it needed to have its own character yet be easy to use. Imagine non-designers with zero knowledge about kerning or leading, or knowing when to italicize or align and what needs to be adjusted, should there be a need to remove or amend. Were there any ideas or explorations that ultimately weren’t used? We explored 20 over posters layout but only presented two concepts! How is this new identity better than the last? We are not in the position to judge if this new identity is better than the last! Ultimately, the clients and the end users need to like them. It is very hard to change the system because of the nature of how the civil sector works, more especially in Singapore, where not everyone values or appreciates design. To us, sometimes it’s not the nicest logo, poster or books that matter, but the day-to-day applications that the target users will see more often, like powerpoint, forms, receipts or promotional items like flyers and brochures for example. At some point of time, it felt like we didn’t really design anything because the designs and template were handed over to the school and the content was put up by technicians, staff or students. Some have no knowledge of design but know simple InDesign to amend images or text. However, it was indeed an honor to be able to design the only full fledged architecture school in Singapore! Similar to what Pentagram has done for Yale Architectures or Main Studios has done for IIIT.